Somewhere in the world, there is a workshop owned by a an inventor named Doc and his Dog, Sprocket. While Doc spends his days coming up with new ideas, Sprocket is peering into a large hole in the baseboard. He knows that something lives behind the wall. Through the hole and down the tunnel, hidden from everyday reality, are brightly lit caves filled with wonderful creatures. This land, bound together by Magic, is called Fraggle Rock. The most notable of the creatures who inhabit this beautiful place are the Fraggles. Fraggles are furry, have tails, and come in all sorts of colors. 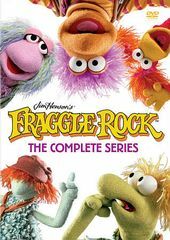 The Fraggles spend their days laughing, splashing, running, singing, playing games, and telling jokes. They live by a simple care-free code.